When you find the perfect person, everything just fits. With their shared interests of music, the Gamecocks and Walt Disney World, John and Casey were an immediate match after their chance encounter at a party. 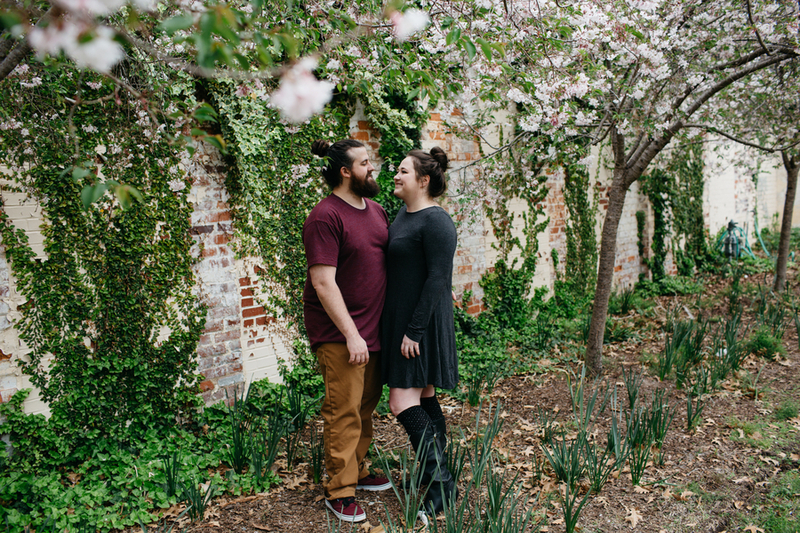 Their fun and funky engagement session in downtown Columbia does a fantastic job of showcasing their relationship and love for one another. Says photographer Alexis Schwallier, "This laid-back engagement session follows the couple getting their favorite coffee, stopping for donuts, creating a DIY bouquet at a local flower truck, and visiting one of their favorite restaurants in town. The restaurant even put up their save the date!" 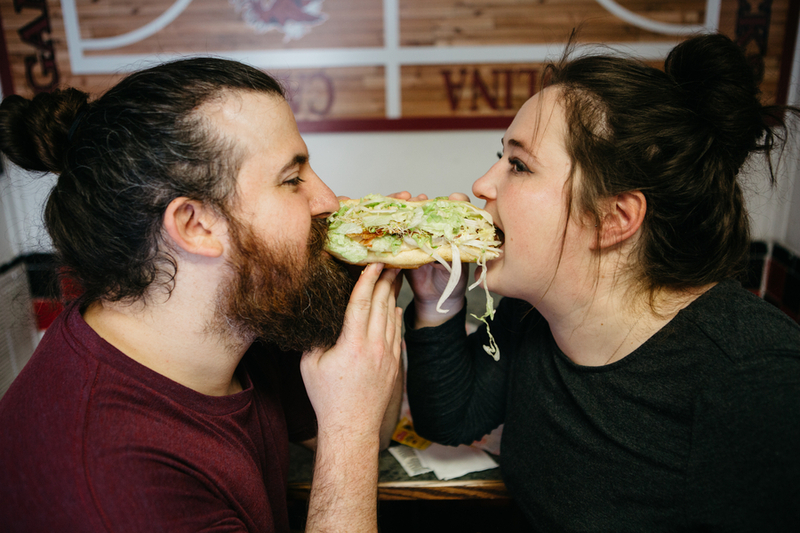 We've never seen an engagement session that features doughnuts and sub sandwiches, but we need to fix that ASAP. There's nothing like a few tasty treats when you're spending a sweet Saturday morning with the one you love! Groom-to-be John shares a bit about his relationship with Casey, their Christmas proposal, and that gorgeous peach diamond ring below. HOW DID YOU AND CASEY MEET? "I was in a band with one of Casey's best friends from High School. It was through this friend when we met at a Rubix Cube theme party at their apartment in Columbia. 'Rubix cube?' you may ask. Well, the goal is to start off wearing items of clothing that are the different colors on a Rubix cube. Throughout the night you were supposed to trade articles of clothing to "solve" the cube. However, I don't recall anyone succeeding. Eventually we became friends on Twitter and the communication began!" WHAT MADE YOU PICK OUT THAT RING FOR CASEY? "Well, it began when Casey was drooling over a ring so much that she took a screenshot of it on Instagram. It was a peach raw diamond ring made by Chinchar/Maloney out of Portland, Oregon. I managed to find the ring and save a picture of it on my phone in a hidden folder. Once the time came for me to get the ring, I called up Chinchar/Maloney. I told them how Casey was enamored by that ring but they told me they didn't have that ring since it was custom made. I thought I was down and out but sure enough they still had a sister stone to the diamond used in the picture! It was fate at that point. Her ring is a rustic peach natural diamond pear shaped with a rose cut surrounded by 6 white pave diamonds on a rose gold band." "We share a lot of the same interests which leads to different trips and adventures. We spent so long working opposite schedules, that we learned to value the time we spent together. We also started to make our own ritual travels. This began with trips to the same restaurant every week, Cantina 76. We both love Disney and so far have been 4 times together. We are both into music. Our relationship band is definitely Dr. Dog who we have seen 8 or more times. We also made Shaky Knees Music Festival in Atlanta our yearly pilgrimage even though this year we aren't going due to a friend's wedding. We both also love to cheer on our Gamecocks at Williams Brice as well as tailgate with our friends." HOW DID YOU KNOW CASEY WAS THE ONE? "We both got that feeling from the acceptance from each other's families. It was just easy to see the future. Casey seems to think that it was after she adopted Mustard which I told her not to because she wasn't ready for that kind of responsibility. But once we picked him up in Greenville, I soon changed my tune. Now I manage his social media!" "It happened Christmas morning (even though Casey said I shouldn't propose on a holiday). It was my first Christmas away from my family ever, so I wanted to impart one of my most memorable Christmases growing up. My siblings and I woke up to an empty living room and immediately freaked out, so much that my Dad had to reveal to us that someone had visited because the milk and cookies were missing. Sure enough, we picked up the plate and on the bottom were 3 clues for us each to go on our own scavenger hunt for presents. Once the ring made it to my parent's house, me and my sister Mary Alice brainstormed clues to build the scavenger hunt just like the one from my childhood. It was 13 clues long with presents at each stop. Halfway through it, I iced her with Smirnoff, and the penultimate clue was to go in the backyard and dig up the the final clue. As she was reading the final clue, I popped the question." ARE YOU EXCITED TO START PLANNING YOUR WEDDING? "Excited to start? We've already begun! We are going to get married in the Rutledge Chapel on the Horseshoe at USC and the reception will be at the South Carolina State Museum. It's exciting to plan but once you get into the thick of things, it can be overwhelming because everything starts to add up. We are mostly sad that Mustard won't be able to participate in the ceremony but we figure he would be more concerned with the squirrels on the Horseshoe."